Licensed Bentley EXP Single Rider Kids Ride-On Car for Toddlers 1-3 Years (Under Supervision of Adult) with Maximum Rider Weight of 55 lb. 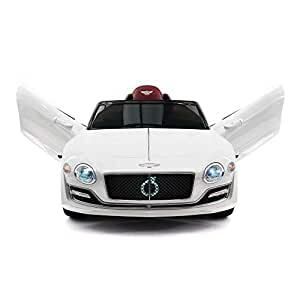 Officially Licensed Bentley EXP12 Kids Electric Ride-On Car with MP3 Player 12V Battery Power, PU Foam Rubber Wheels, Leather Seat with 3 Point Safety Harness and 2.4 GHz Parental Remote Control Approved and Manufactured under Official License from Bentley Motors Ltd. ASTM F963 Compliant Product (US Consumer Toy Safety Standards) Suitable for Boys or Girls 1-3 Years Old (Under Supervision of Adult) with Maximum Rider Weight of 55 lb 12V Battery, 2 Motors, 2 Speeds (3 Speeds controlled by Parental Remote), Maximum speed 2-4 Mph Forward / Reverse Shifter Switch, High Speed / Low Speed Switch NEW! Full Function Long Range 2.4Ghz Parental Remote Control with remote STOP function NEW! Soft Start and Electric Brake System for Gradual Acceleration and Reliable Braking NEW! Soft and comfortable PU Leather seat with 3 Point Safety Seat Belt Realistic working Imitation LED Headlights / Tail Lights / Dashboard Lights and Gauges NEW! Zero Maintenance Soft EVA Foam Rubber Tires (Provide Good Traction and Comfortable Quiet Ride) NEW! Integrated MP3 Player with AUX MP3 Audio Input, Plays files from Micro SD card, USB Flash Drive or external devices like iPod, iPad, iPhone or Android Phones Engine and Horn Sound Buttons on the Steering Wheel, Digital Battery Voltage Meter on Dashboard Requires Assembly, Estimated Assembly Time is 20 min NEW! Smart Battery Charging Technology, Automatically controls Battery Charge and Prevents Overcharging Battery Charging Time 1 – 8 Hours (Automatically Controlled), Riding Time 45 min – 90 min (Depending on ride conditions) Assembled Dimensions: Length – 42″, Height – 15.5″, Width – 23″ (With Mirrors). Seat Width – 14″, Seat Depth – 7″, Dashboard to the back of the seat – 15″ Max Shipping Weight: 36 lb.